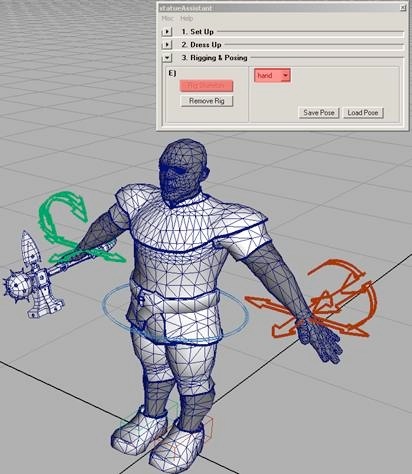 This statue tool was used on Vanguard to assist artists making all sorts of statue starting points and giving them the ability to easily update and make variations to those starting points. 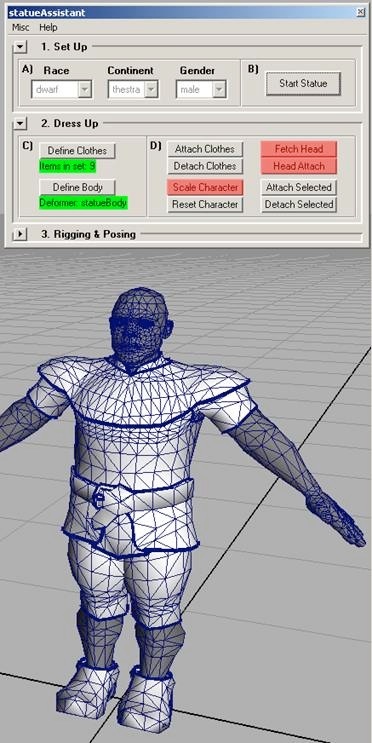 Automatic Skeleton Rigger – sets up a control rig that is easy to pose and to manipulate. 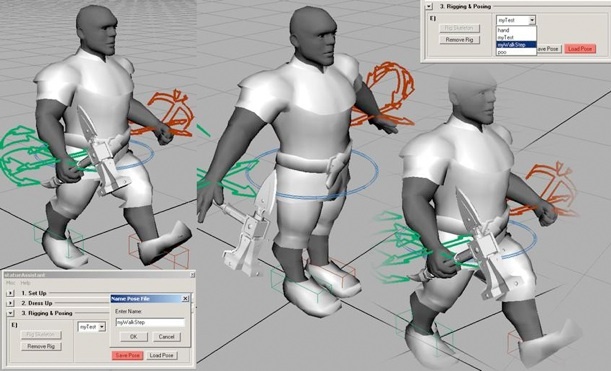 Pose Library – Save out your poses so that other artist can use them straight up or as starting points for new poses. Race, Continent and Gender Choice – Pretty self explanatory. 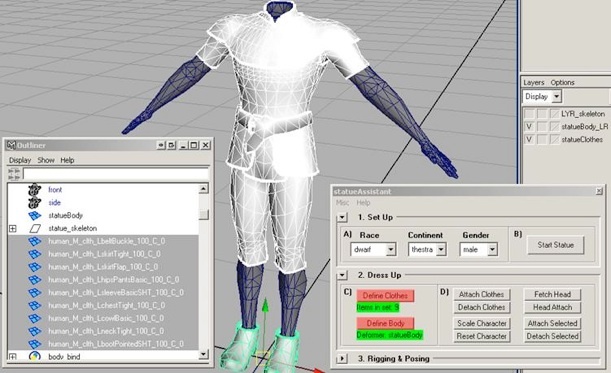 Clothing, tools and weapons – User can make their own or import already existing assets. After the clothes are brought in or modeled all pieces are selected and defined also the body is defined as such. 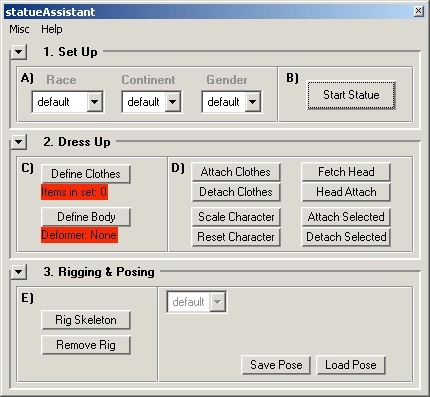 Attach Clothes – Click the Attach Clothes button and all clothes will be attached to the body. The scene Informant will contain a wrapDistance attribute for tweaking the search envelope for better performance. 1.Click the Scale character button and the race you pick will be achieved. 2. Click the Fetch Head button to import the head for the race that you have selected in the Race drop down menu. 3. 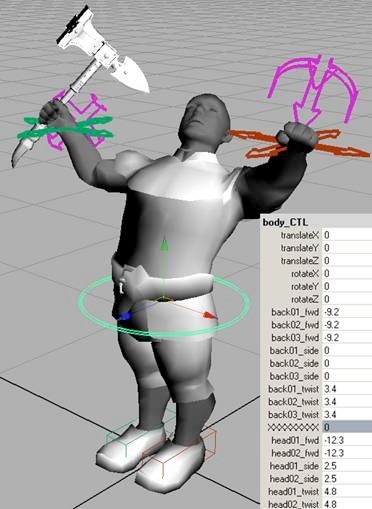 Select the head (you can have multiple in a scene) and click Head Attach to attach the head to the skeleton so it will move with the character during the posing stage. Select a joint from the skeleton (turn off the body layer and on the skeleton layer) then shift select any assets that you want to attach to this joint, then press the Attach Selected button. 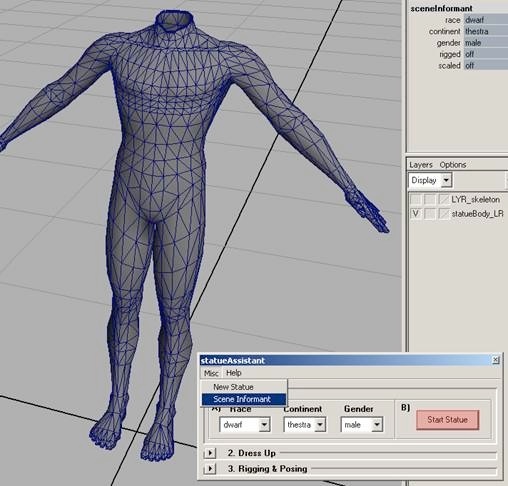 To detach these meshes you can select any number of meshes that are attached to any number of joints and click the Detach Selected button. 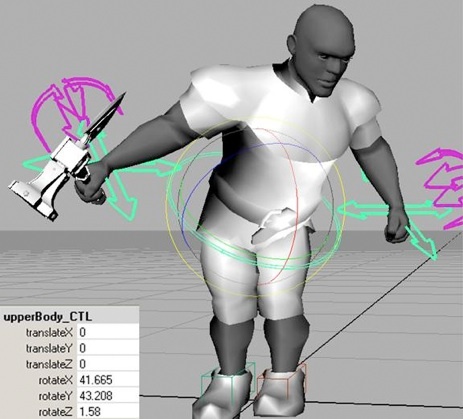 Rig Skeleton – You are now ready to rig the skeleton. Click the Rig Skeleton button. When you Rig the skeleton, the pose library becomes available. 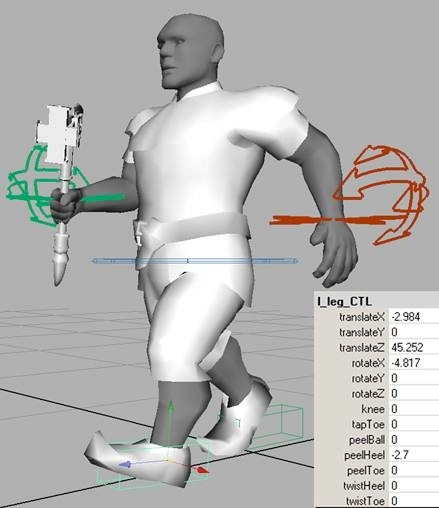 Rig Controls -On each control object, you will find custom attributes to further control the posing of the statue……. Pose Saving and Loading (and sharing) – When you have found that perfect pose, press the Save Pose button, give it a name and hit the OK button. You can now reset the statue by loading the default pose. To go back to the pose, select it in the list where it will now appear and click Load Pose. Note about Poses – I decided to split the libraries into two categories, tall and short, because poses for taller races did not work so well for shorter races and vice versa. There definitely is a way to make all work, but involves lots of code calculations, so due to time constraints, this was the most efficient route to take. The detection on which library to display for the user happens automatically based on which race has been made. Artists can submit their poses into our source control software and have them be available to other artists as various starting points. 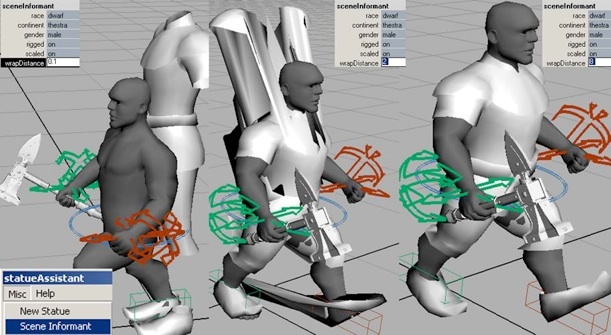 Wrap Distance and Scene Performance – When you have posed the character out of the default rig pose, select the Scene Informant (Misc->Scene Informant). Try to find the smallest number possible that will retain the clothing around the body. 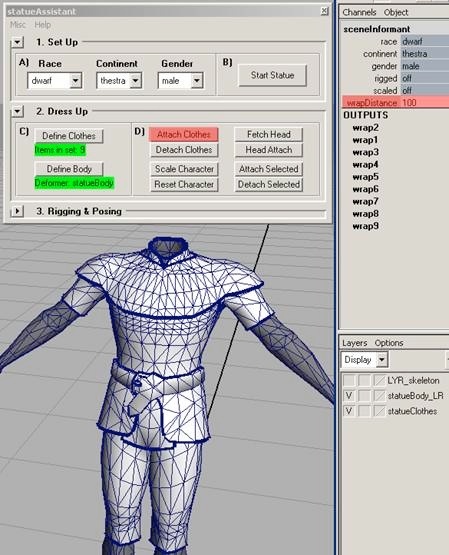 Wrap nodes are computationally expensive so if you attach a variety of clothing sets to make several statue variations, you want to reduce this number as much as possible. 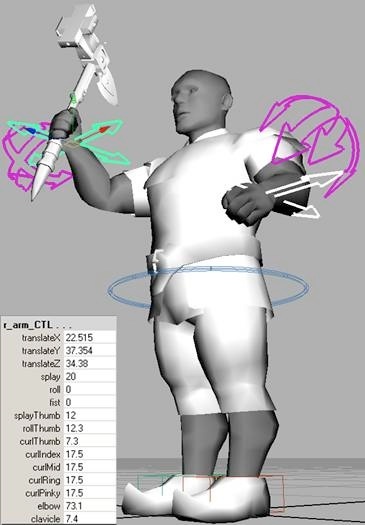 The wrap deformer (the body in this instance) acts as a lattice and the wrap distance is the distance away from the normal of each vert that Maya will go out to look for objects to deform, so the smaller that value is, the quicker this evaluation will become.